If you had asked me three years ago if I’d be interested in joining the Peace Corps, I would have chuckled and said, “no thanks.” Already three years out of college, the thought of running off to serve a two-year stint in the Peace Corps seemed like an escape from developing a stable career at home. But after realizing the opportunities Peace Corps service can provide, I look back on the past year and know it’s been the best decision I’ve ever made. I graduated from the University of Texas at Austin in 2005 having majored in history and anthropology. During my college career, I wrote for the university’s newspaper, then later worked in politics on a gubernatorial campaign and at a lobby firm, and had a private-sector job with an architecture firm. Through these activities I developed a passion for the way policy and culture influence the well-being of communities. The decision to finally apply was mostly based on the desire to challenge myself to live in a culturally new environment, and commit to a long-term goal that would enable me to grow personally and professionally. My uncle, who served in Peace Corps Peru during the early 1960s, became an inspiration to me when considering Peace Corps service. His enthusiasm for the program stoked my curiosity, and the more I looked into the benefits, the more I liked the idea of being able to work closely with locals on a local income level. Following a year-long application process, I arrived in Botswana in April 2010, and was assigned to spend my service in Francistown, the second largest city in Botswana, and home to a vibrant population of over 100,000 people representing all levels of the wealth spectrum. It has a wonderful, distinct flavor that incorporates both traditional and modern Setswana culture. I work with smart, passionate men and women in the District AIDS Office, which is the government office that oversees all HIV/AIDS organizations and programming in the district. Part of my job entails introducing fresh ideas to help improve the way the office functions. I also help connect the District AIDS Office with the community at large, mostly through involvement in HIV/AIDS related campaigns and helping the HIV/AIDS organizations address challenges and improve their skills so they can better serve their community. Volunteers and locals work together toward promoting positive behavior change, and as a Peace Corps volunteer, my primary focus always centers on making sure the change I bring will be sustainable after I leave. Peace Corps volunteers work not to save the world, but rather strive for incremental improvements that will last after service is complete. Along with fulfilling my initial goals, new experiences I encounter daily continue to bring a wealth of knowledge I couldn’t acquire in any other setting. For instance, the cramped, long-hour bus rides between cities taught me an etiquette to maintaining order on a bus with almost zero personal space. I’ve seen elephants and lions roam their native habitat, attended a huge wedding celebration in the tiny village of Mapoka, been awakened to beautiful traditional dance and music, and feel as if I’ve become a part of real life here. More significantly, I’ve worked on a campaign where teenage boys in Francistown signed up by the hundreds to voluntarily get circumcised in order to increase protection from contracting HIV. Never before had I seen such an immense sense of personal responsibility displayed at such a young age. My work here is fulfilling, and I’m fortunate to have made lasting friendships with volunteers and locals. But service is not easy. I can’t say that I haven’t had some trying days, but that’s where personal growth comes in. Once out of your comfort zone you may begin to answer questions about yourself you never thought to ask before. And then out of the blue, things beyond your wildest expectations push you forward, and answering those questions becomes a little easier. Recently, Botswana Peace Corps volunteers attended an event held at the U.S. Ambassador’s residence in the capital, Gaborone. We were given the rare opportunity to shake hands with First Lady Michelle Obama during her visit to Southern Africa. It was a fleeting yet incredible experience that reminded me how great things can happen when risks are taken. It’s not every day one gets to shake hands with someone who is essentially living history, and it made me proud to be where I am and do what I’m doing. I try to take nothing here for granted, and so for the rest of my service (and beyond), I intend to live up to that handshake. Ann & Nate Levine Academy alumna, Alexis Kanter (’96) is the daughter of Nancy and Jay Kanter. She is in the middle of a two-year term of duty with the U.S. Peace Corps. 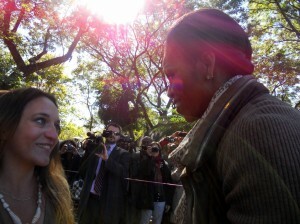 For more on her meeting with First Lady Michelle Obama and her life in Botswana, check out Alexis’ blog at http://www.alexiskanter.wordpress.com.